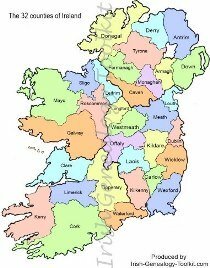 Below are brief details of the counties in Ireland that begin with the letters M to S: from Mayo to Sligo. The nicknames given are principally used in relation to sport, especially those sports under the auspices of the Gaelic Athletic Association, but many of them are also used in daily speech outside of any sporting context. In Irish, the county is called Maigh Eo, meaning the Plain of Yews. It is in Connaught province, is the third largest of the counties in Ireland, and is a wild mountainous region with a long and beautiful Atlantic coastline. As a result of its topography it is known as both the Heather County and the Maritime County. 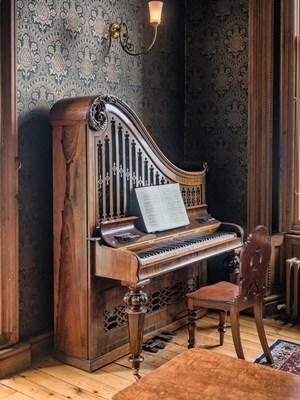 Upright piano at CountryLife Museum, Castlebar, Co Mayo. © Frank Bach. Because it suffered so dreadfully during the Great Hunger, the phrase "Mayo! God help us!" became a fixture and is still used, albeit usually in an ironic context these days. Its county town is Castlebar but its largest town is Ballina. The only other town of any size is Westport. 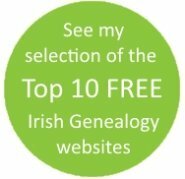 According to 1890 records, the most common surnames associated with County Mayo include Walsh, Gallagher, Kelly, Malley, Moran, Duffy, McHale, Gibbons, Joyce, Connor, Conway, Higgins and Murphy. Griffith's Valuation was carried out in 1856-7. In Irish, Mayo is called Maigh Eo, meaning the Plain of Yews. It is in Connaught province, is the third largest of the counties in Ireland, and is a wild mountainous region with a long and beautiful Atlantic coastline. As a result of its topography it is known as both the Heather County and the Maritime County. In the 2016 census, Mayo's population was 130,507 (down from 192,183 in 1911), of which 27% were aged under 25 and 89% were of Irish nationality. Just under 44% reported they could speak Irish. 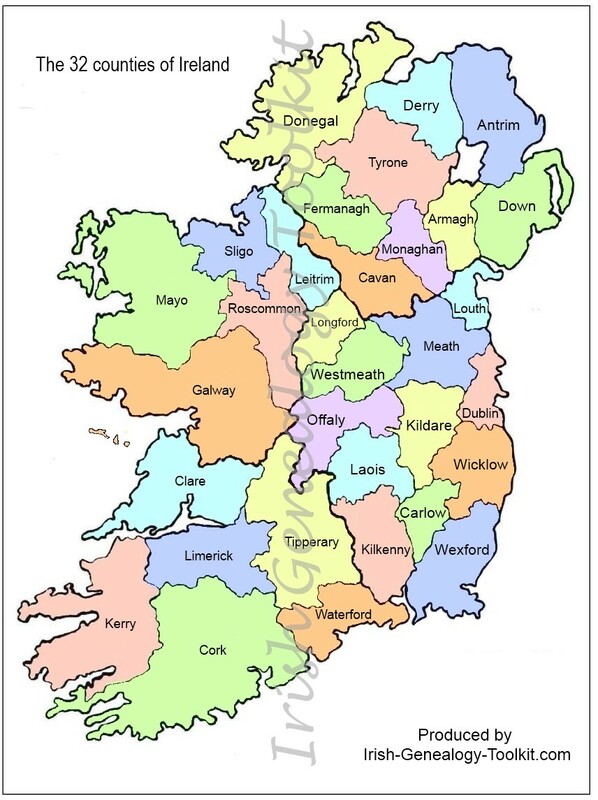 In Irish, the county is called Mí, a simple word for an uncomplicated meaning of Middle (province). It is in Leinster province and is known as the Royal County because the Hill of Tara, home of the legendary High Kings of Ireland, is within its boundaries. 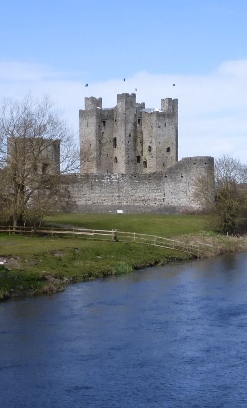 Trim Castle sits on the River Boyne. It is the largest Norman Castle in Ireland. It was also the scene of one of Ireland's most fateful battles - the Battle of the Boyne in 1690. Near that fateful bend in the river is the 5,000 year old Brú na Bóinne archaeological complex, a UNESCO Heritage Site, which includes two of Ireland's most spectacular Neolithic monuments: the huge, accessible passage tombs of Newgrange and Knowth. 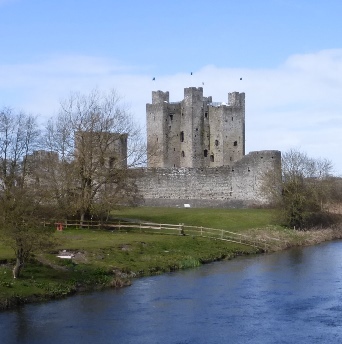 Today, the county is home to many Dublin commuters and its principal towns are Navan (the County Town), Trim and Kells. Its population in 2016 was 194,942, very nearly three times its size in 1901. 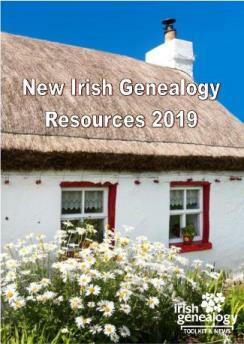 According to 1890 records, the most common surnames associated with County Meath include Reilly, Smith, Lynch, Brady, Farrell, Farrelly and Kelly. Richard Griffith carried out his Valuation survey in Meath in 1855. It was also the scene of one of Ireland's most fateful battles: the Battle of the Boyne in 1690. Nearby, is the 5,000 year old Brú na Bóinne archaeological complex, a UNESCO Heritage Site, which includes two of Ireland's most spectacular Neolithic monuments: the huge, accessible passage tombs of Newgrange and Knowth. In Irish, the county is called Muineacháin, meaning a Place of little hills. The name is a perfect description for this sparsely populated region and has earned Monaghan the nickname of Drumlin County. 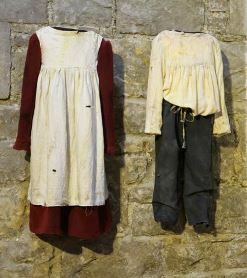 Children's clothes, worn by inmates of Carrickmacross Workhouse, which is now open to the public. It is one of the three counties of Ulster province to remain within the Republic of Ireland and has a border with Northern Ireland. The County Town of Monaghan developed in the 18th century thanks to Irish linen industry. Its prosperity is still apparent in the town's rich legacy of Regency style buildings. Other sizeable towns in Monaghan are Carrickmacross, home to a restored Workhouse and Famine Museum (open Monday to Friday, 9am to 5pm, all year; weekends by appointment), Castleblayney and Clones. According to 1890 records, the most common surnames associated with County Monagahn include Duffy, Connolly, McMahon, McKenna, Hughes, Murphy and McCabe. Griffith's Valuation was carried out in 1858-60. The County Town of Monaghan developed in the 18th century, largely due to the Irish linen industry, and its prosperity is still apparent in the town's rich legacy of Regency style buildings. Other sizeable towns in Monaghan are Carrickmacross, home to a restored Workhouse and Famine Museum (open 9-5 Monday to Friday, all year; weekends by appointment), Castleblayney and Clones. According to 1890 records, the most common surnames in Co. Monaghan include Duffy, Connolly, McMahon, McKenna, Hughes, and Murphy. In Irish, the county is called Ua Fáilghe, meaning the Descendants of the Tribe of Failghe. It is in Leinster province and used to be known as King's County. Today's unofficial nickname is the Faithful County, since the word appears on its crest of arms. 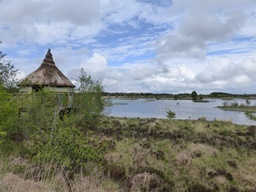 A visitor hide at the Lough Boora wildlife reserve. Most of the county is flat and bogland. 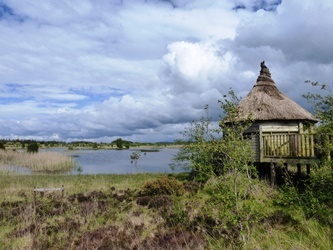 Despite its generally unexceptional landscape - an exception can be found at the Lough Boora Nature Reserve, run by the Irish Wildlife Trust - Offaly is home to one of Ireland's most important Christian sites, Clonmacnois, and what many believe to be the country's most perfect Georgian town: Birr. Offaly's main town is Tullamore. According to 1890 records, the most common surnames associated with County Offaly include Kelly, Dunne, Daly, Egan, Molloy, Mooney and Carroll. The county was surveyed for Griffith's Valuation in 1854. The 2016 Census found that Offaly has the highest proportion (88.6%) of Roman Catholics in all the counties in Ireland. Known in Irish as Ros Comán, meaning Saint Coman's wood, landlocked Roscommon is located in the Irish province of Connaught. Locals are called Rossies or (light-heartedlly) as Sheep Stealers, a term which refers to the common crimes committed by many of those transported to Australia. 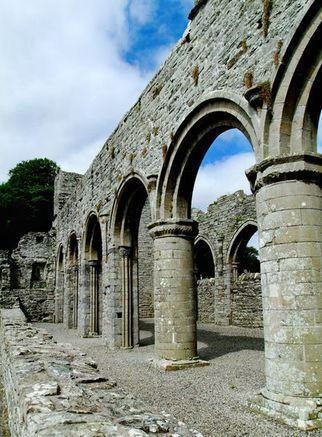 Boyle Abbey is a Cistercian Monastery founded in the 12th century. Two medieval ruins are all that remain of a colossal 13th-century castle and an Abbey in the county town of Roscommon but the busiest visitor attraction in the county is Strokestown Park House and its Irish Famine Museum. Other towns include Boyle and Castlerea. According to 1890 records, the most common surnames associated with County Roscommon include Kelly, McDermott, Beirne, Regan, Flanagan, Connor, McDonagh, Quinn, Murray, Brennan and Higgins. In the 2016 census, some 86% of people living in Roscommon identified as Roman Catholic, and 88% said they were Irish. The total population was 64,436, roughly a quarter of what it was in 1841. 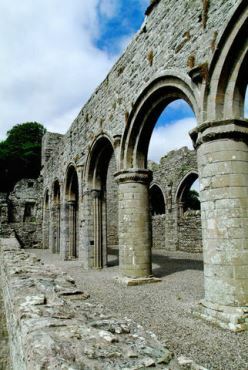 Boyle Abbey was founded in the 12th century. Two medieval ruins are all that remain of a colossal 13th-century castle and an Abbey in the county town of Roscommon but the busiest visitor attraction in the county is Strokestown Park House and its Irish Famine Museum. Other towns include Boyle and Castlerea. Griffith's Valuation was carried out in 1857-8. In Irish, the county is called Sligeach, meaning Shelly river. It is in the province of Connaught and contains the largest concentration of megalithic monuments on the island, including Carrowmore Megalithic Cemetery, one of Europe's most important prehistoric sites. It's landscape is dramatic, from the striking Belbulben rock formation, to the surfing hot spots along the Wild Atlantic Way coast. The County Town, also called Sligo, had a population of 19,199 in 2016, making it the largest town in the province. It also has many connections with Ireland's greatest poet, W B Yeats. The only other town of any size in the county is Tobercurry. According to 1890 records, the most common surnames associated with County Sligo include Brennan, McLoughlin, Gallagher, Kelly, Harte, McGowan, Walsh and Kennedy. Griffith's Valuation was carried out in 1858. It's landscape is dramatic, from the striking Belbulben rock formation, to the surfing hot spots along the Wild Atlantic Way coast. It's an outdoors kind of place. The county town, also called Sligo, had a population of 19,199 in 2016, making it the largest town in the province. No wonder, then, it calls itself the capital of the northwest. 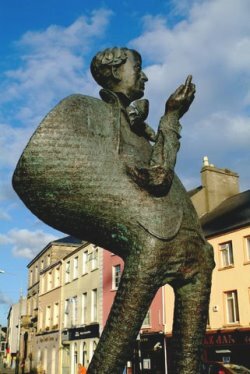 Sligo also has many connections with Ireland's greatest poet, W B Yeats. The only other town of any size in the county is Tobercurry. In 2011, the population of County Sligo was 65,393. There are 32 historical counties in Ireland. Click image to download larger version of map.